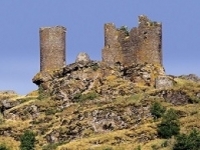 The circuit that we recommend you follow to discover the history, the castles and chateaux of the ‘Cathar Country’ does not include Carcassonne, a major town cited in another article in the section ‘Holiday Ideas’. 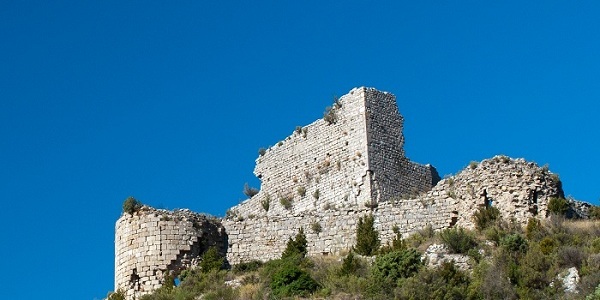 A visit to this south eastern area will take you back in time to the era of Catharism and the crusades organised by the King of France and the Pope among which you will discover the Corbières Châteaux. All year round privately owned seasonal rental properties are available so it is easy to find a guest house in Cathar Country, a Cathar Country holiday rental property or even a holiday home at Corbières, close to the sea and the seaside resorts. From Carcassonne to Rennes le Château the distance is around 45 kilometres by the D118 to the south of Carcassonne. You will cross Limoux and could even stop and taste the ‘Blanquette de Limoux’ (famous local sparkling white wine). Rennes le Château is well known for the legend of its curate, Bérenger Saunière, and his mysterious treasure that enabled him to restore his church. Leaving Rennes le Château for Arques you will pass through Couiza before taking the D613. You should allow around 20 minutes for 16 kilometres. 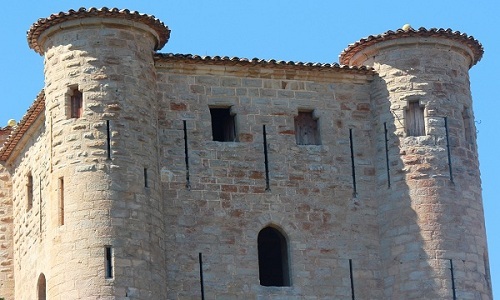 Arques is renowned for its rectangular dungeon and four towers. 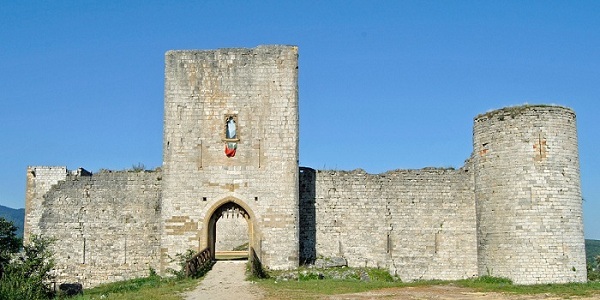 The village of Arques is fortified and there is an exhibition on the Cathar religion in the Déodathouse. When you finally leave Arques, take the D613 in the direction of Couiza then the D118 for Quillan and finally the D117 to Puivert, allow 43 minutes to complete the 40 or so kilometres. The château at Puivert was subjected to a siege in 1210 and then enlarged in the 14 th century. It is kept its square tower and its 35 metres high dungeon. Several rooms can be visited here. From Puivert, rejoin the road to Quillanand from there take the D117 for Axat. Continue along the D117 to reach Puilaurens. Allow 40 minutes to complete the 35 kilometres. Puilaurens Château has a superb botanical walk that is highly recommended. The château dominates the village of Lapradelle and from around 700 metres overlooks the Boulzane valley. One of the ‘5 Sons of Carcassonne’, this chateau is composed of 2 compounds and 4 round towers. It is definitely worth visiting. When you leave the chateau we recommend you visit the Aguzou grotto and Gorges of Sant Georges and Pierre Lys. From Puilaurens, take the D117 towards Saint Paul de Fenouillet, then Maury to reach Duilhac. Allow around 45 minutes to complete the 38 kilometres. From Duilhac take the D123 towards Cucugnan and just before arriving there take the smaller road leading straight to Quéribus Chateau. 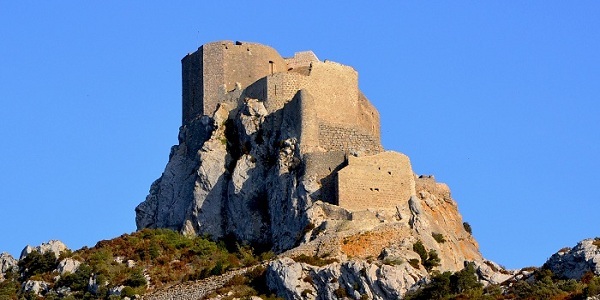 From this château, at an altitude of 730 metres, you can see the château of Peyrepertuse and the plain of Roussillon. This is a grandiose site with a lovely view over the Mediterranean and the summit of Canigou. The visit is fairly short with two rooms that can be visited, one is gothic in style. After leaving rejoin the road towards Cucugnan then Duilhac to reach the château at Peyrepertuse. Thus is a distance of 5 km, taking around 10 minutes. 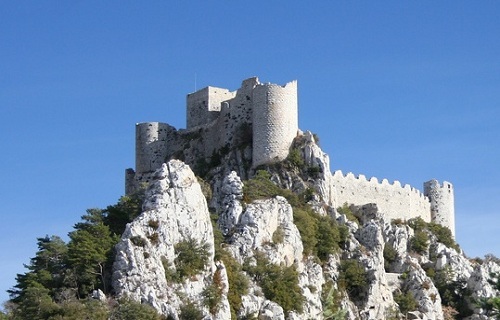 The Château of Peyrepertuse is one of the ‘5 sons of Carcassonne’. It is an exceptional site from which you can see both the Pyrenees and the sea. The fortress is actually composed of two chateaux; to the east is the lower château, to the west is Château Saint Georges. To get there you will need to take the hillside walk which takes around 30 minutes for the round trip. The chateau is composed of a middle compound with a lower court and chateau angled to the east and a dungeon. To the north is the Château Saint Georges accessed by the Saint Louis stairway. After your visit take the D14 towards Tuchan then the D611 for a short distance before arriving at the Château d’Alguilar. It is a distance of only 7 km taking around 12 minutes. This chateau was a royal fortress in 1257 that dominated the Tuchan plain. It is composed of two hexagonal compounds and six round towers. Do not miss a visit to the medieval village of Tuchan which produces the celebrated Fitouwine. From Tuchan take the D39 towards Villerouge Termenès, this is around 25 kilometres and will take approximately 30 minutes. 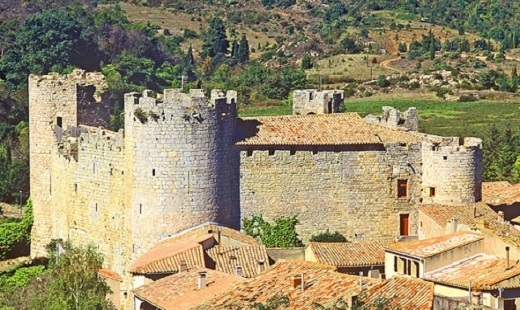 Villerouge Termenès is a charming village surrounded by the four round towers of its restored chateau providing a lovely example of military architecture from the 12 th and 13 th centuries. An audio-visual guided tour is available that will help you enjoy its history to the full through Guillaume Bélibaste and the Narbonne Archbishop, Bernard de Farges together with the daily life of the domain. Visit the medieval village of Villerouge Termenès and explore the alleys and old winding streets and the Saint Etienne church and other features. From Villerouge Termenèstake the D113 in the direction of Termes. Allow around 20 minutes to complete the 15 kilometres of road. Termes Château, ceded to the King of France in 1228, dominates theTerminet Gorges. It is composed of two compounds one of which encloses the castle chapel. A visit to the Temes village and Terminet Gorges is highly recommended. From Termes, finish the tour by taking the D40 in the direction of Saint Martin des Puits and stopping at Durfort Château. The circuit stops here although you may wish to visit other Cathar Châteaux in this area, maybe less known but just as interesting and appealing. Information can be found through the Tourist Office at Carcassonne. Where to stay in Corbières? For your stay in the Corbières area, choose a holiday rental property in the Carcassonne region in one of the villages described in our tourist circuit. You will easily find an Aude holiday home or holiday rental property in Languedoc Roussillon enabling you to easily visit the châteaux and make it easy to combine some time at the seaside resorts by choosing a Saint Cyprien holiday rental property, a seasonal rental at Argelès Beach or a Canet en Roussillon or Port Barcarès holiday rental property. Merci de nous préciser si les accès aux chateaux est facile en camping-car. Stationnements autorisés ?